As a council leader you have to be prepared to slug it out with the political opposition. But you might not expect to have to take on the likes of Sting, Mark Knopfler and Bryan Ferry. Yet that's what's facing Newcastle Council's leader Nick Forbes. The local authority has announced plans to end all funding of arts organisations in the city. It says it has been left no choice because of unprecedented cuts in government support. Mr Forbes has said the alternative would be to cut "life and death" services to vulnerable people in the city. But a group of musicians, writers and artists connected to the region believe there is a choice, and Newcastle has made the wrong one. They're led by Lee Hall, writer of Billy Elliot and The Pitmen Painters, and a man who began his career in the city. He's now assembled a cast list of north east artistic legends to sign an open letter urging the council to think again. As well as the aforementioned Sting, Knopfler and Ferry, the campaign has the support of Angel sculptor Antony Gormley, Pet Shop Boy Neil Tennant, folk musician Kathryn Tickell, actors Alun Armstrong and Robson Green and Auf Wiedersehen Pet trio Tim Healy, Jimmy Nail and Kevin Whately. The letter is a stinging indictment of the council's approach, which the signatories believe will "decimate the cultural life of the city." It says: "Generations of young people will be denied access to the opportunities we were given and without the council's support the arts will become a pursuit for the most wealthy. "By the council's own admission these cuts are blanket and pre-emptory. "No strategy has been made to save any part of these thriving organisations and it seems to us a short-sighted attack on the arts and the idea that culture should be available to all." The collection of artists believes the cuts are out of line with what's happening in the rest of the country, and asks for the reversal of what it calls a "baffling" decision. In addition, some of the individual signatories have also waded in. Musician Mark Knopfler said: "It is mortifying and shaming that these 100% cuts should be in Newcastle, which has always enjoyed such a rich tradition in the arts." Bryan Ferry said: "I was born in the north east, went to school there and then studied fine art at Newcastle University. I think it would be very sad if young people in the north east today were not given the same chances that I had many years ago." And Lee Hall added: "The council is out of step with all other authorities. The list of signatories demonstrates Newcastle is remarkable in having produced so many artists who did not come from privileged backgrounds." The signatories talk about the decision being economically short-sighted. And on the face of it, it does seem odd that a city that saw culture at the centre of its renaissance a decade ago should now be withdrawing funding from arts organisations. But the council insists this is a sign of the times. In the late 1990s and early 2000s councils were queuing up to fund arts organisations and support new venues. At the time all those organisations would bank on getting council support well into the future, but money is indisputably tighter now. The council is making £90m of cuts in the next three years. Nick Forbes insists he's withdrawing arts funding reluctantly. He said: "The cut in government grant is grossly unfair - at a time when more and more families are turning to us for help. "Financially, this has put us in an impossible position from which there is no escape. "We will not abandon the residents of this city, but as we cease to provide some services they will have to do more for themselves and expect less from the council." And when I posted some of the artists' comments on Twitter, there was some backlash from people who suggested they would have been better advised to address their concerns to the government. Some even thought the likes of Sting, Ferry, and Knopfler might have enough money to step into the breach and solve the problem rather than highlight it. But this coterie of cultural greats looks unlikely to step away from its fight with the council. It believes there is an alternative even in austere times. And on that score they seem to have found an unlikely ally in Communities Secretary Eric Pickles, who has also told Newcastle's leadership to take its cultural responsibilities more seriously. 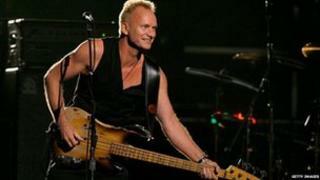 The question is can Newcastle Council now resist pressure from a supergroup of Sting, Ferry, Knopfler and Pickles, or will we all eventually have to accept our local authorities can no longer fund the arts?